The Combined Arts Conference was held on Saturday 19 March at the Magill Campus of UniSA. The conference brought together educators from all sectors of the arts including dance, drama, media, music and visual arts. The five teachers sponsored by the Teachers Registration Board took full advantage of the range of workshops on offer and their conference reports are now available to read on our website. Expressions of Interest are invited from registered teachers who would like to attend the Australian Association for the Teaching of English and the Australian Literacy Educators’ Association 2016 conference ‘Weaving worlds with words and wonder’. The TRB has five sponsorships available. Find out more here. 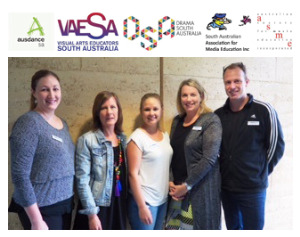 The Geography Teachers Association SA (GTASA) annual conference is being held at the EDC Hindmarsh on 26-27 May. More information here. GTASA is also holding a Spatial technologies workshop at Pedare Christian College on Saturday 28 May. More information here. Royal Institution of Australia presents STEM careers in SA – now and the near future for middle and secondary teachers. The Science Exchange, 7pm – 9pm Wednesday 18 May. For more information email tmeyer@riaus.org.au. EdTechSA present ‘Maker projects & the digital technologies curriculum’ at Adelaide University on Tuesday 17 May, 5pm – 7pm. Find out more here.